Rings Around Saturn - Universe Galaxies And Stars Section. Nothing But Rings Around Saturn. Saturn’s rings. Image credit: NASA/JPL/SSI. This photograph is a close-up view of Saturn’s A ring taken by Cassini. Look closely and you’ll see that the dark regions appear to widen and then narrow, and the thin bright regions disappear altogether. Cassini took this image on July 23, 2006 when it was 285,000 kilometers (177,000 miles) from Saturn. 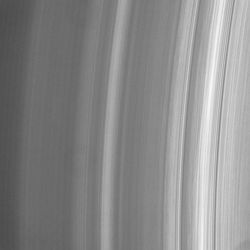 This close-up view of the inner A ring shows intriguing variations in brightness along the direction of ring motion - from top to bottom. Close examination reveals dark regions that appear to widen and then narrow, and thin bright regions that disappear altogether. Variations in brightness are to be expected in the direction of increasing orbital distance from Saturn, but variations along the azimuthal (or circumferential) direction are unusual, as they should be smoothed out quickly by ring particle motion. The image was taken in visible light with the Cassini spacecraft narrow-angle camera on July 23, 2006 at a distance of approximately 285,000 kilometers (177,000 miles) from Saturn. Image scale is 1 kilometer (0.6 mile) per pixel.